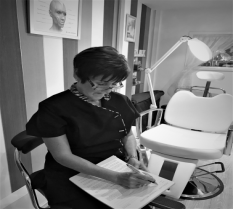 Our sole aim is to make your consultation as relaxed as possible, so please feel free to ask any questions relating to the treatment/s you are considering. We are here to help you. All Dermal filler treatments and wrinkle/muscle relaxing treatments require a thorough pre-treatment consultation with our trained practitioners. Dermal fillers are not a prescription only medication (POM) and in some cases treatments can be carried out on the same day as your consultation. Wrinkle/muscle relaxing treatments (Botulinum Toxin Type A) are a (POM) and therefore require a thorough pre-treatment consultation with a prescriber. POM consultations are charged a deposit of £30, but will be deducted from the cost of any treatment should you be deemed suitable. Unfortunately, failure to attend your appointment will result in the loss of any deposit paid. During the consultation, you will be asked questions relating to your health and any medication you are currently taking or have been prescribed. On the day of your treatments, we would kindly ask if you would remove all make up before arriving for your appointment. This is of course at your discretion, but will help to reduce the time for treatment. Injections can not be administered until the area/s have been cleaned and sterilised for infection control purposes.